You will take tests, quizzes and other assessments in the “Assignments, Tests, and Surveys” area. You can also view individual test scores here, and if set up by the instructor, you will be able to review submitted tests to see how you did on individual questions. When you click on “Assignments, Tests, & Surveys”, if any assessments are open, or have been accessed, your screen will look like the following example. If no tests have been published by your instructor, the screen will be empty. Title: links to begin or continue a test appear under the title. If there is no link, the test is not currently available to you. Status: you can see if a test is not yet open, ready to begin, started but not turned in, or finished by looking at the status column. Open/Due Date: shows date and time when test is open and when it closes. Tries: shows how many attempts are allowed and how many attempts have been submitted. If unlimited tries are allowed, it will be indicated by an infinity symbol. Finished: This column shows the date and time of the highest attempt, if graded, or the latest attempt, if ungraded. If feedback is set to ‘immediate,’ you will see the review page as soon as you submit the test. You can also click on the review link at a later date to view it again. If review is not available until a specific time, that date will be listed. The review link will become active at the specified time. If no feedback is available, no review link will be shown. If the test is graded, the highest score/review is shown in the Grade column. If the test is ungraded, the Review page, if allowed, shows the latest try. In a future release, students will be able to review all tries. If the test allows multiple tries, the highest score is always used for grading. To take a test, go to the “Assignments, Tests, & Surveys” (left navigation menu of your course site). To begin a test, click on the Begin link under the title of the test on the Test List page. You will be taken to a test entry screen, Begin Test instructions page, such as the examples to the right. 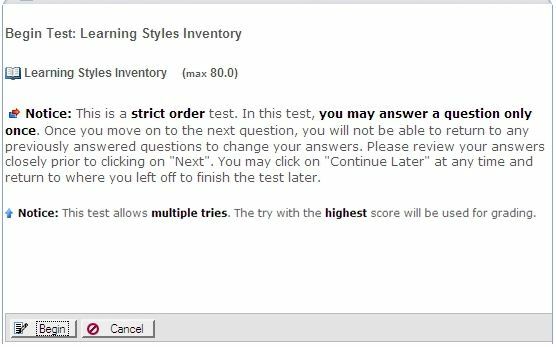 This screen contains instructions and information about your test’s settings and expected behavior, as set by your instructor. You will be able to access this information while taking the exam, as well. Don’t worry about forgetting the fine details of the instructions. The instructions will vary, depending on the type of test your instructor has published. The following is a ‘strict’ order test. And, the following sample ‘begin test’ page is from a flexible order test. Click on the Begin button to start the test. If you’re not ready to take the test after all, click on the Cancel button. Keep in mind that you may exit and continue later, in any test, but you must return and complete it within the time period that it is open and within the time allotted, if it is a timed test. When you exit, the clock keeps running! You will have access to all instructions (instructor instructions, timed, flexible order, strict order, or part instructions) via a link at the action bar of a test, accessible from every page of the test. Your instructor may require you to provide a rationale for some of the questions. True/False and Multiple Choice questions are types of questions where your choice may need to be justified. If you forget to provide the required rationale, you will be alerted when you click on “Finish.” The software will take you to the Table of Contents (TOC) where questions with missing rationales will be highlighted. You may then return to the question to complete the missing information. Here is a screen shot of what it will look like. Just click on the question in the TOC list to return to that question for answering. Your test may be set up with one question per screen, or you may have several questions on one screen. In either case, there will be a bar of buttons at the top and bottom of the page. These buttons allow you to go to the next question, save your work and leave the test to continue later, or to submit your test by clicking on the Finish button. You may also be able to return to previous questions or a Table of Contents list of all your questions, depending on if the instructor chooses those options or not. When an instructor creates a test, he can set it up so you can move back and forth between questions, changing your answers at will, and going to the Table of Contents (TOC) to see what you’ve left unanswered or marked to review later, prior to submitting the test. This is called a ‘ flexible ‘ order test, and it is the most commonly used type by instructors, especially for short, weekly quizzes. Alternatively, your instructor can set up a test so you can answer a question only once. If that option was chosen, you will only be able to move forward. This is called a ‘ strict ‘ order test. In strict order tests, you are not allowed to go to previous questions and there is no Table of Contents. Once a question has been answered, you won’t be able to return to it. You will be able to leave the test and continue later. If you click on “continue later” and return, you’ll return to the last question, where you left off . If you see a question but don’t answer it, you’ll get an alert message warning you to answer it. If you decide to move ahead anyway, without answering it, you won’t be allowed to return to this question. Strict order is typically chosen by instructors for high-stakes exams that count for a large percentage of the grade and there is concern about academic dishonesty. Under each question there is a “mark to review later” check box (only available in flexible order tests). This feature will flag the question and you can return to it later to rethink and/or revise your answer. If you’ve used the ‘check to review before finishing” feature, before submitting your exam you will be directed to the Table of Contents page where you will be able to see which questions you marked for review. They will have a special icon next to them. You can click on the question in the list to return to that question to review your answer, and revise it, if you want. The Table of Contents will list questions that are marked for review, as well as unanswered questions, and those which required rationale but you didn’t complete. 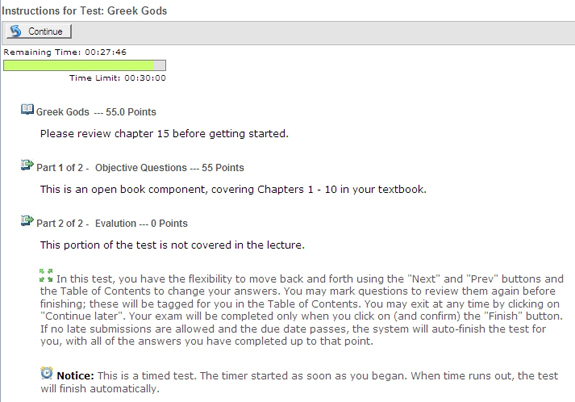 When you are finished with your test, click on the Finish button, available at the top/bottom of each page. If something has been left incomplete (no answer or no rationale), you will be taken to the Table of Contents page with the warning that something has been left unanswered. You should go back and complete the indicated question(s). If your instructor has set up to display all the questions on one page, your answers are NOT saved, until you click on ‘Save’ or Continue Later or Finish. If you are used to, and nervous about, how computers and internet connections crash, save your work often by clicking on the Save button next to each question. Save will save your work on the page, and will return you to the question from which you pressed save. When you are sure you are finished with your test, click on the Finish button. If there is nothing left unanswered, you will see, a confirmation box allowing you to Finish or Cancel. Click Finish again to submit the test. What happens after submitting a test depends on the settings selected by the instructor. You may or may not see a “Thanks for your submission” message. You may or may not see a review page with your answers marked. You may be taken back to the “Assignments, Tests, & Surveys” list of tests. Please read the next section about review. After submitting a test, you will see a confirmation page, if the instructor added one. Otherwise, you may see a review page (if feedback is set to “immediate” by the instructor). If the instructor does not allow Review until a future date, you will see when Review of your scores and results will be available. If the instructor does not allow immediate feedback, you will be taken to the list of tests where you can see the date submitted, if you are allowed more tries, and your score (if enabled). Etudes treats tests with hard due dates (late submissions not allowed) as timed tests. If you take a test that has a hard due date, you will see a colored bar timer when the test is within two hours of the due date . If there is plenty of time left before the test closes, the bar will be green. It turns red when the test is over. The timer shows in the list of tests, in the enter screen, and while you’re taking the test (viewing questions, TOC, and instructions). In list view the timer sits in the “due” column in place of the normal date display. Once you’ve submitted the test, or if it’s past due, the test list shows the normal due date display. When time is up, you will see a red bar and the test will be submitted. No matter what you’re doing or at what point you are in the test (answering questions, staring at a monitor, looking at the TOC, or have exited a test to continue later), when a hard due date is up, the test will be auto-completed and submitted on your behalf, with whatever answers you have already. You will not see any feedback during test delivery. You may see feedback after a test has been submitted depending on the test settings of your instructor. Exactly what is shown and when a completed test’s Review is available to learners is dependent on the settings of the test (immediate, at a specific date, no feedback, etc.). If the instructor has set the test to ‘immediate’ feedback…. You may also see correct answers, correct/incorrect feedback and overall feedback. The instructor may choose to show you just your answers but not the Answer Key until later or never. Some instructors worry about academic dishonesty (students sharing the answer key) and don’t show the answers. You will be able to return to this review page at a later time to see it again along with any remarks made by the instructor while grading essay questions. When a test is graded, you will see a score. If an instructor chooses to show feedback at a later time, the Review link will not be there until then. If Review is not immediately available, but will be at a later time (say after the test due date), you will be taken back to the test list view after submitting your test. You’ll see that the test has been finished, along with the date and time finished and possibly your score. The link to the review page is not visible yet. 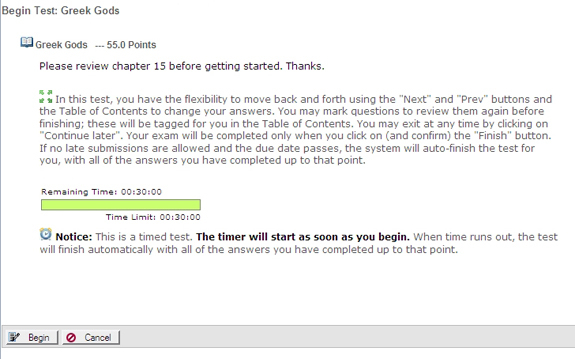 Once the feedback display date set by the instructor is reached, the Review link will appear and will show the test questions, your answers and score (if enabled), along with any optional feedback set by the instructor: correct answers, correct/incorrect feedback, overall feedback and grader’s comments. If the setting is set to “no feedback will be shown to students,” when you complete a test, you will be taken back to the test list view. You will see that the test has been finished, along with the date and time finished and possibly the total score (minus essay questions that may have to be graded still). There will no be a link to a review page. If the instructor changes the feedback options to allow feedback (immediate or at a specific date), then a link to a review page will appear. Depending on the settings your instructor chose when creating the test, you may be able to see your test scores in Review, the Test List (Grade column) and in the Gradebook. However, it’s possible that it is set up so the test scores don’t show anywhere until the instructor reviews the answers and grades the submissions. In that case, you will see ‘ungraded’ in the test list, and you will see a ‘ – ‘ in the Gradebook. Or, the instructor can choose to never show grades in the Gradebook, if the test is not administered for a grade, and perhaps there won’t even be a Gradebook in your class. These options are all set by the instructor so they may vary from class to class.